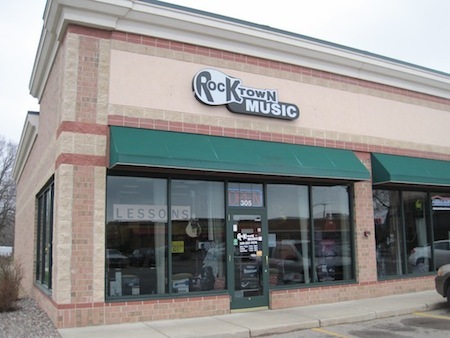 No other music store will rock your world like Rocktown Music in St. Cloud, Minn. Founded in 2009, the 2,400-square-foot guitar haven carries more than 400 acoustic and electric guitars, making it the perfect destination for rockers and acoustic players alike. Owner Joel Knutson says he’s proud of what his shop offers. A full-fledged guitar player and collector, Knutson has a strong penchant for the instrument that’s especially noticeable when he’s talking about Guild. Knutson boasts a personal Guild collection of more than 15 distinctive models, including a 1969 F-212, a 1972 D-25 and a rare four-string CE-100. His collection is so fine, in fact, that Mark Dronge, son of Guild founder Al Dronge, personally inquired about a few of the models. Knutson’s preference for Guild is apparent on entering Rocktown. He has devoted an entire wall to the brand and made it his store’s main acoustic guitar line. So if you’re a Guild fanatic looking for Guild guitars sold by a true Guild connoisseur, your best bet in the upper Midwest is Rocktown Music.